The sound of people people using a strimmer sets my teeth on edge. I hate them! They do so much damage to wildlife including hedgehogs, frogs and toads. This is the story of Holly and her journey to recovery from a terrible strimmer wound. She was found at the end of July with her head sliced open, underneath a Holly bush. You can see from the pictures where the strimmer blade has cut deep into her head. Holly is lucky – a few mm closer and the blade would have entered her skull. When Holly was found, it was Summer and flies had laid eggs in the wound and hatched into maggots. These had to be painstakingly removed one by one and then the wound washed out with antimicrobial wound treatment and saline. Holly was put on a course of antibiotics and pain relief. The wound was cleaned daily to stop infection and a special wound gel was added to aid healing. Holly’s wound after around 10 days of treatment. It has scabbed over but needs cleaning daily to prevent infection. Eventually, the wound healed and new spines started to grow through where the wound was. Holly fit and well and ready to go back to the wild. Check all areas of long grass carefully before mowing or strimming. Hedgehogs nest in long grass. Ideally keep areas of grass long for wildlife and don’t strim at all. Encourage everyone you know to check before they mow – a simple check can save hedgehogs as well as frogs, toads and other wildlife that loves to nest or forage in long grass. I run a hedgehog rescue in York, England and have nursed hundreds of hedgehogs back to health. You can find out more about my work here and also how to support it. 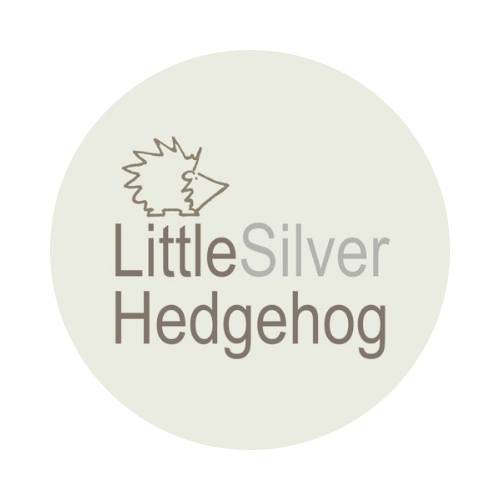 I also make silver jewellery inspired by nature and wildlife to raise funds for my hedgehog hospital. You can visit my online jewellery shop here. My blog is full of tips and advice on helping wild hedgehogs – please take a look around my other blog posts and see what you can do to help our spiky friends. Brilliant success story Emma. What an amazing tale of perseverance on your part! Oh poor little thing! She must have been in so much pain. I’m so glad she was one of the lucky ones, and I hope people are beginning to be more aware of checking for wildlife before hacking into their habitat. A lovely story about what you do for the hoggies and hope it helps more people become aware of the dangers of strimming to wildlife if you don’t check the area first. Before we do any strimming, grass or hedge cutting i always walk around the area first not only looking for hedgehogs but the other wildlife, afterall that 5 mins checking the area could save a hoggy’s life. What a transformation after a long period of care and healing. Thanks for all you do in caring for these animals and also for the educational work you do inspiring others to help hedgehogs in the face of ever-diminishing habitats in a world of ever-increasing dangers. Your rescue work must be heart breaking at times and very demanding, but so rewarding when rescues like Holly’s turn out so well and her health is restored. I fancy there is even a twinkle in her eye. This is really sad to see. Our neighbours opposite have a big untended garden and strim it brutally once a year. We have been feeding our hedgehogs for three years now. Last year we would see two at the back door feeding pot at once, but this year only one, though I am almost sure there are two feeding at different times (I saw three in the garden one night). A few weeks ago the very big regular one missed a few nights and then reappeared briefly, possibly with a scar, then disappeared when the temperature fell and I assumed he had tucked himself up for the winter. I kept putting out the food and a very small hedgehog began to appear regularly. He is still coming, though we rarely see him, but he picks out the dried mealworms and sultanas and leaves much of the rest. The RSPB changed the feed mix and they don’t like it as much. I have just treated one with the exact same injury, I was hoping that new spines would grow back, I can see a few around the edges but nothing in the middle yet. After reading what you have said I am hopeful.